Although the Undo History and standard Undo functions are available, try to get in the habit of creating backups before processing or editing. This provides a safety copy of your audio recordings in case something unexpected happens, due to a processing error or other unforeseen event. You can make manual backups of the file you’re editing, or replace it with a backup version at any time, using a variety of functions. 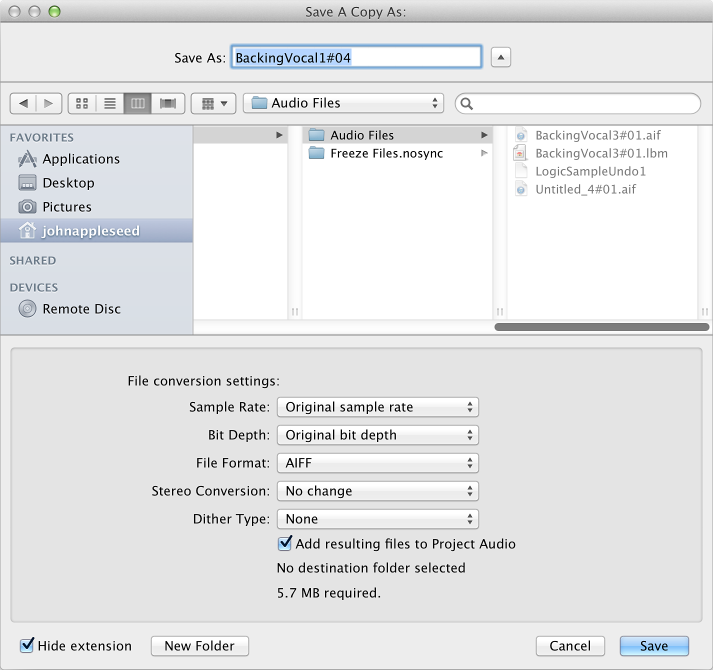 Choose Audio File > Create Backup from the Audio File Editor menu bar (default key command: Control-B). A copy of the audio file (with the extension .dup) is created in the same folder as the source file. Choose Audio File > Revert to Backup from the Audio File Editor menu bar (default key command: Control-Option-Command-B). This function completely replaces the current audio file with the backup (provided one exists). Important: You cannot reverse this function with Undo. Choose Audio File > Save A Copy As from the Audio File Editor menu bar. You can set the sample rate, bit depth, file format, stereo conversion, and dither type for the destination file. The dialog also features an “Add resulting files to Project Audio” option, allowing you to add the file to the Project Audio Browser, following the save. Browse to the location (such as a hard disk and folder) where you want to store the audio file, then enter a name for the audio file in the Save As field. Choose Audio File > Save Selection As from the Audio File Editor menu bar (default key command: Shift-Command-S). The Save Selection As dialog includes the same file conversion choices as the Save A Copy As dialog.